Saltwater ecosystems “make up the largest aquatic system on the planet, covering over 70 percent of the Earth’s surface,” according to the U.S. Environmental Protection Agency (EPA). Saltwater ecosystems provide food and other economic resources such as tourism. Saltwater ecosystems have come under stress in recent decades as the world’s population increases and the condition of the environment diminishes. Marine wetlands are “transitional areas” between the ocean and coastal lands, according to the U.S. Geological Survey. 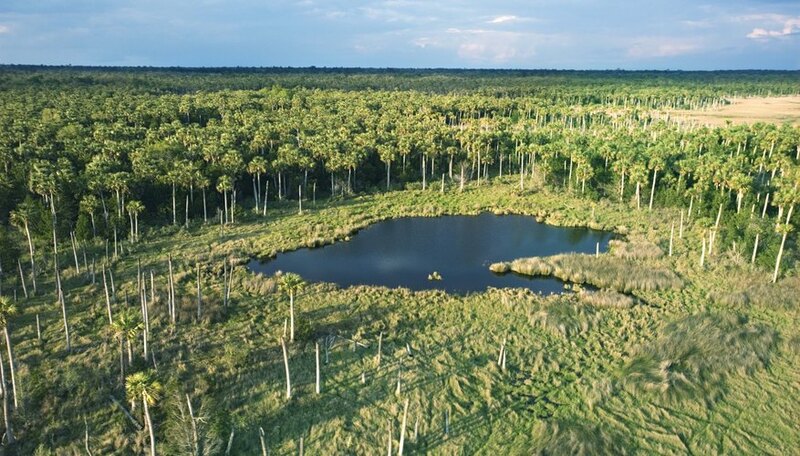 Saltwater wetland ecosystems include mangroves and marshes. Organisms adapted to living in wetlands habitats live part of their life outside the water and must adapt to a cycle of changing water salinity. 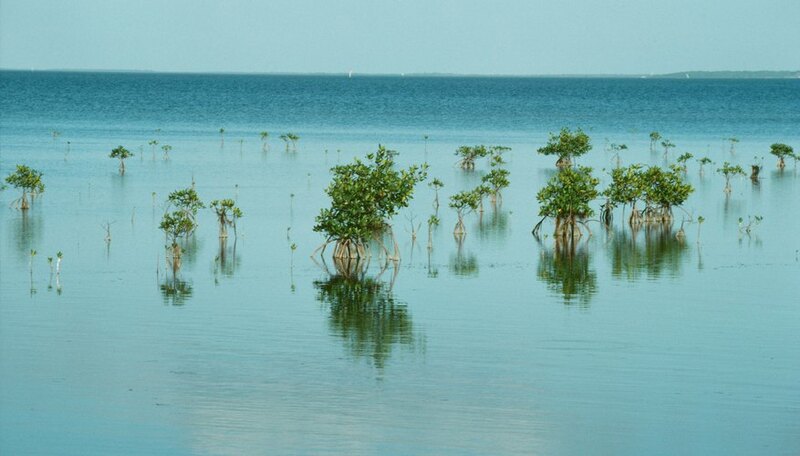 Mangrove trees are essential to coastal marine ecosystems. According to the U.S. Fish and Wildlife Service, mangroves provide habitats for numerous organisms; harbor nesting sites and foraging grounds for birds, reptiles and mammals; buffer storms by functioning as wind breaks and baffling wave action with their roots; and filter the water by catching sedimentation and detritus in their roots. Saltwater marshes occur in protected areas along the coastline and provide many of the same benefits of mangrove habitats. Instead of mangrove trees, herbaceous plants and grasses dominate saltwater marshes. Estuaries are another important marine ecosystem where saltwater and freshwater meet to make a brackish mix. According to the National Oceanic and Atmospheric Administration (NOAA), estuaries “provide habitat for over 75 percent of the U.S. commercial sea catch,” including crabs, clams, oysters, shrimp and other fish species. 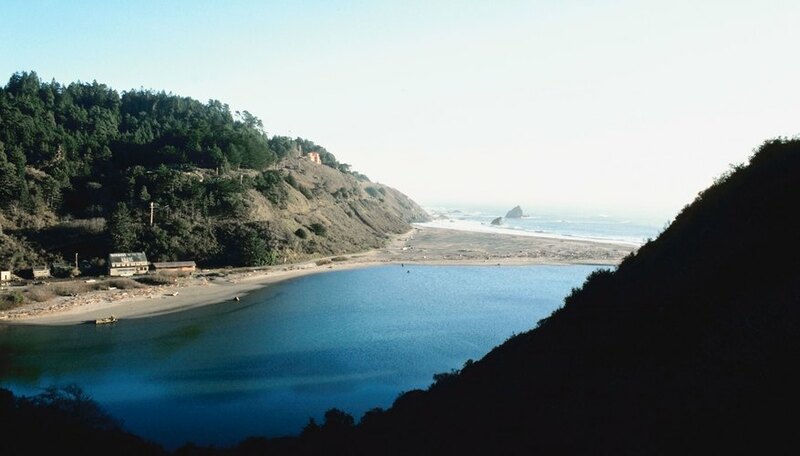 Estuaries also provide an important habitat for birds, mammals, reptiles, amphibians and insects, and estuary vegetation helps to filter runoff and other pollutants. However, since most water drains from the land to the ocean via estuaries, potential for pollution is high. Pollution diminishes estuary ecosystems and impacts the humans who depend on estuaries for food. 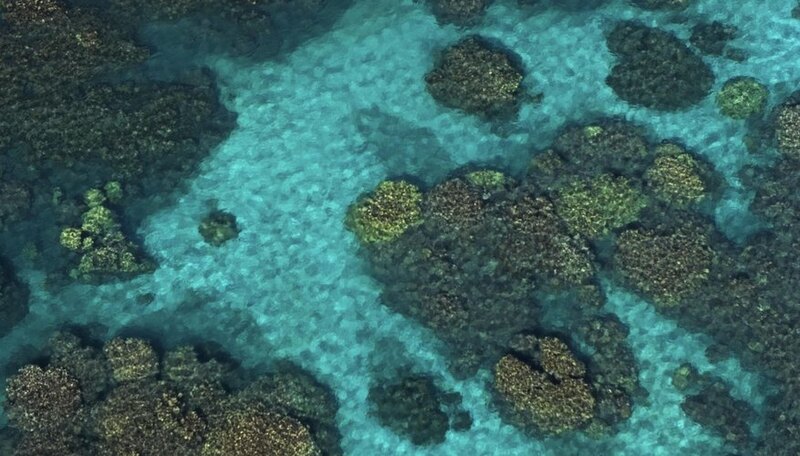 “Coral reefs are among the world's richest ecosystems, second only to tropical rain forests in plant and animal diversity,” according to the EPA. 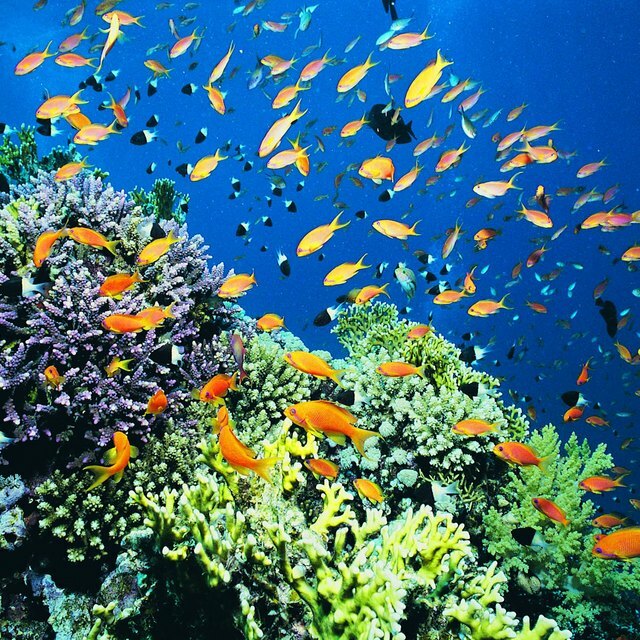 Tropical coral reefs occur in shallow, warm waters, typically off the coast of a land mass or in areas where islands once existed. Corals reefs are fragile ecosystems that are sensitive to imbalances in water quality and habitat species. Coral reef food webs begin with algae, which are the primary source of energy in the reef. Corals and other filter feeders depend on plankton—a form of algae—and detritus. Larger reef species rely on corals as a source of food and for protection, and coral reefs provide a protected nursery and hatchery area for many important fish species. The open ocean, referred to as the “pelagic zone,” is the largest marine ecosystem, according to the National Earth Science Teachers Association (NESTA). The further the ocean stretches from the coast, the more its depth increases. Deep, open ocean ecosystems receive fewer nutrients, less light and are colder than near-shore habitats. Biomass decreases and currents increase as ocean depths increase. The open ocean is home to microscopic floating plankton and also supports large sea mammals and bony fish with the following adaptations: streamlined bodies and specialized buoyancy features for long-distance swimming and sonar or good eyesight for hunting in the dark water. 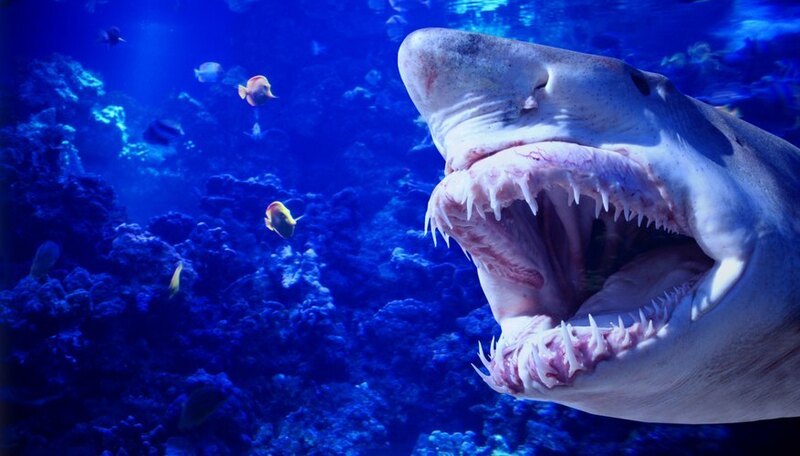 The large fish of the open ocean are an important food resource for humans and include tuna, swordfishes and sharks. King, Jennifer. "Types of Saltwater Ecosystems." Sciencing, https://sciencing.com/types-saltwater-ecosystems-6385556.html. 24 April 2017.